Inwards from Route 1 at the town of Hveragerði, a mere 40 minutes from Reykjavik, I find the trailhead to the area’s famous hot river. The sign says Reykjadalur: 3 kilometers. 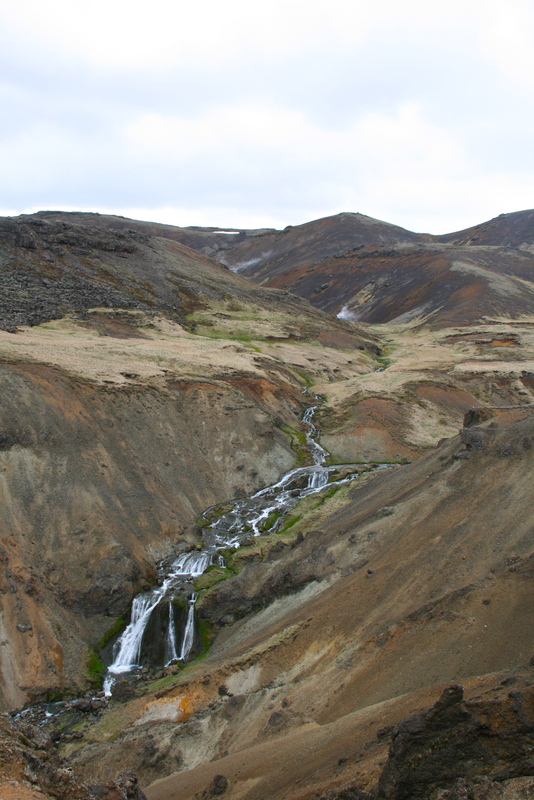 Not so far, I can easily go up and back and continue along on my day of Iceland sightseeing. A steaming landscape of bubbling mud and green algae, pleated hills of cooled lava rock and the thick-peated moss cushioning it, ending in this hot river, or so I’ve heard. I have my swimsuit on under my clothes, but as I walk up the trail I see that nobody else appears to have come for the bathing. Instead, there are Europeans in thick hiking boots and rain coats, some with hiking poles for good measure. It’s steep, steeper than I was expecting — this is by far the longest 3 kilometers I’ve ever walked. I’m starting to wonder if the sign was accurate, or what exactly it was measuring. There are streams along the path, and I dip my fingers in every so often. Some are warm, some cold. I finally reach a river: warm, maybe 100 degrees. And not deep enough to swim in. But the trail continues, so I go along with it. I spy off the trail a pool of opaque pastel blue, the same color as the Blue Lagoon the tourists flock to. 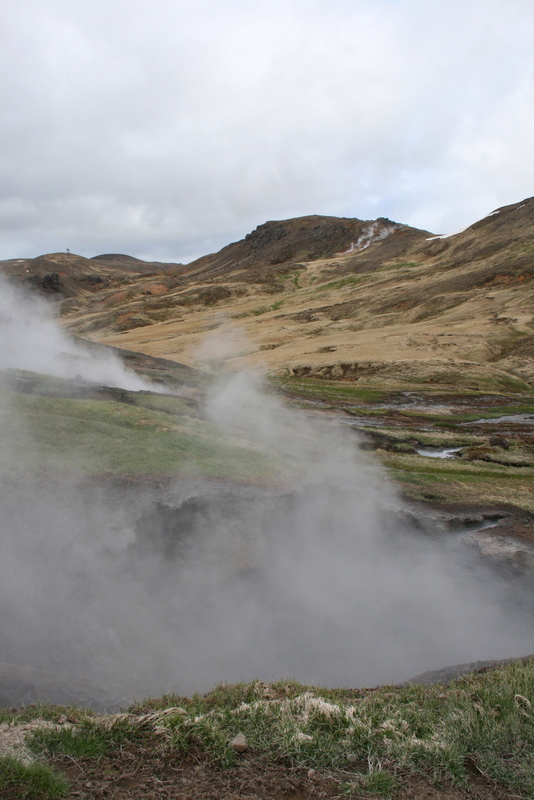 I know the conventional wisdom in geothermal areas: don’t leave the trail; you might melt your shoes, you could fall through the crust of the earth into a steam vent and die. But there are tracks — boot tracks have worn a thin trail down to the lagoon, and there are tire tracks too from a tractor that sits off the trail not far away. So I go gingerly, circling my destination, fingers outstretched against trickles of moisture to test the coolness of the earth. The water is cold, running cold into the blue pool, and the water coming out of the pool is the perfect temperature, hot without being too hot. I follow the white-silica streambed up higher and higher until my hands are in the edge of the pool, and then I shed my clothing and climb into the pool, just a bit, then a bit more, kneeling because I know better than to get any closer to the drop off into the earth, the unknown sinkhole with its unknown rivers of volcanic water. I dig thermal mud from the sides of the pool and coat myself in muddy black. And I sink down at the edge of the pool, looking up at the trail, watching the hikers go by, watching them stop and point at me, and I lift my foot out of the water and wave. I am probably a bad influence. Perhaps I trust my ability to spring out, nimble and sure-footed, practiced in the art of barefoot escape across otherworldly landscapes, if the pool bubbles up suddenly. It’s around 40 degrees F and windy, but I decide that I will hike back down to the river barefoot, cross-country in my wet bathing suit, which I do, over the spongy moss and the odd loose rock, following the stream downwards. The marshes next to the river are freezing, but the river itself provides relief when my feet get too cold. I warm up in the river and then I provide myself with the task of changing out of my wet bathing suit in plain view of the trail without actually being seen, which I manage by draping myself in the odd assortment of clothing I have packed along in lieu of a towel. It’s times like this that I feel like I might, comparatively speaking, be crazy. But I’m laughing too much at myself to care. This is Iceland. 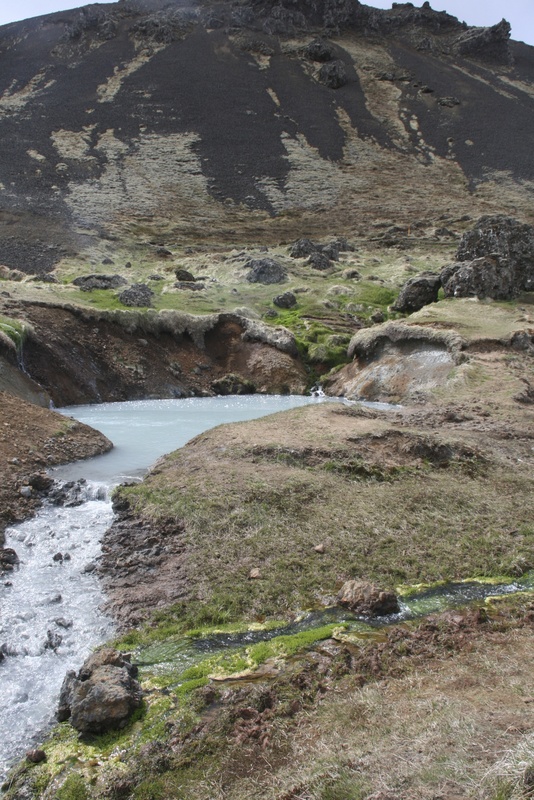 You survive in Iceland by being crazy, comparatively speaking.